Reaction Kinetics, Volume II: Reactions in Solution deals with the kinetics of reactions in solution and discusses the basic principles and theories of kinetics, including a brief description of homogeneous gas reactions. This book is divided into two chapters. The first chapter focuses on the general principles of reactions in solution that includes reactions between ions and involving dipoles; influence of pressure on rates in solution; substituent effects; and homogeneous catalysis in solution. 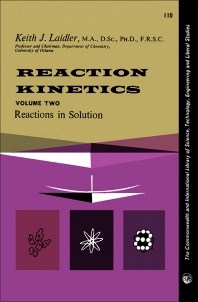 Chapter 2 primarily deals with general features of reactions in solution, emphasizing the relationship between the results of a kinetic investigation and actual reaction mechanism. This volume is intended for undergraduate students of chemistry who have not previously studied chemical kinetics. This book is also useful to more advanced students in other fields, such as biology and physics, who wish to have a general knowledge of the subject.